Adding to its already-distinguished staff, the Risk Prediction Initiative (RPI2.0) recently welcomed Dr. Mark Guishard as its new Science Program Manager. RPI2.0— part of BIOS —works to create effective and efficient dialogue between scientists and (re)insurers involved in catastrophic risk by funding and showcasing academic research relevant to the (re)insurance industry and assisting in translating science into applications for the industry. 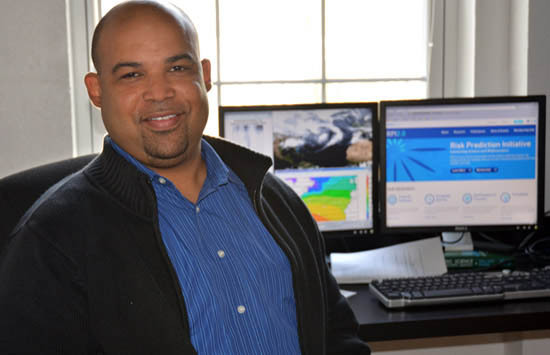 Dr. Guishard is familiar to many Bermudians, having served as the Director of the Bermuda Weather Service (BWS) from 2006-2012 and, prior to that, as a Forecaster for the BWS since 1997. A Bermudian, Dr. Guishard obtained his B.Sc. and M.Sc. degrees from the University of East Anglia (UK) and went on to receive his Ph.D. from Penn State (US) with a dissertation focusing on the meteorology of subtropical storms, hurricanes and extra-tropical cyclones in the Atlantic basin. During his time as Director of the Bermuda Weather Service, Dr. Guishard also served as an Adjunct Scientist at BIOS, where he taught courses for visiting university groups, gave public lectures, and participated in RPI science workshops. In conjunction with his duties at BWS, he served as Bermuda’s representative to the U.N. World Meteorological Organization (WMO) where he was appointed the English-speaking Vice Chair of the Regional Hurricane Committee. He also represented the WMO and Bermuda on the U.N. regional coordination group on tsunamis and other coastal hazards. After six years as Director of BWS, Dr. Guishard broadened his professional expertise by working as a “cat modeler” (catastrophe risk analysis and modeling) for a Bermuda-based reinsurance company. RPI2.0 and BIOS are pleased to welcome Dr. Mark Guishard to its staff and look forward to working with him on providing what’s needed for using today’s science to make better business decisions tomorrow. For more information about RPI2.0, please visit their website at http://rpi.bios.edu.